Space startup Uwingu announced today that its Mars Crater Mapping project at www.uwingu.com is performing well and has experienced strong growth during its first 10 days on the market. The project offers the public to the opportunity to name craters on Uwingu’s new map of Mars. It was launched February 26th to help create a $10M fund for Uwingu Fund grants. These grants will support a wide range of individual space researchers and educators hurt by budget cuts, as well as space projects at universities, companies, and non-profit space organizations. Uwingu’s Mars map grandfathers in existing named craters on Mars, opening up the remaining 500,000+ scientifically catalogued but as-yet unnamed craters for naming by people around the globe. Prices for naming craters on Uwingu’s Mars map vary depending on the size of the crater, beginning at $5 dollars. Uwingu makes a shareable Web link and a naming certificate available to each crater namer for each newly named crater. In its first 10 days after the debut of the Mars Crater Mapping Project, Uwingu’s newsletter subscriptions have skyrocketed almost 400% to over 10,000, its Klout web score and Facebook following have each risen 50%, and over 50,000 unique web page visits have been logged. In those same 10 days, over 7,000 crater name purchases have been made on Uwingu’s Mars map, about half the number of crater names made by committee naming processes over the entire past 50 years. Purchases of Uwingu crater names have come from 78 countries, with over 50% of all purchases being made outside the United States. Purchases have been logged from six continents—only Antarctic has not yet posted a purchase. Yesterday, Uwingu announced its ninth grant derived from funds it has generated; the grant was made to Astronomers Without Borders, a global astronomy community of enthusiasts, educators, and others around the world who participate in programs that create interaction and cooperation through common interests in all aspects of astronomy. 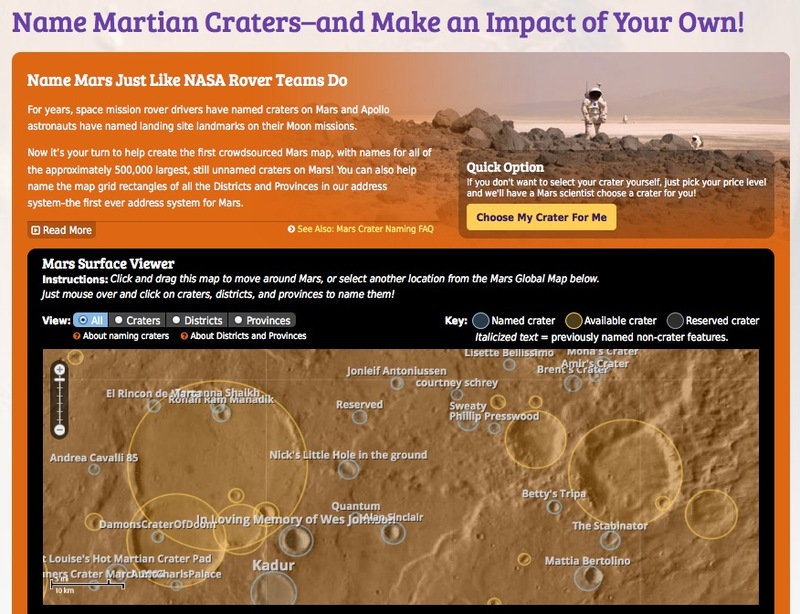 Anyone can participate in the Mars Crater Naming Project at Uwingu’s web site, www.uwingu.com . I joined up as an Uwingu supporter tonight, after reading the press release from Mars One. I hope no one minds, but, I wrote a story, published tonight in Digital Journal about the new partnership, and the Mars Crater Naming Project. I will be naming my crater next week, and I can hardly wait. Great! Thanks Karen. Please let us know if you’d like to speak further. We been busy giving interviews and would love to talk to you too.